“I was drawn to GV Financial after learning about their Behavioral Wealth Management model. It allows for deeper client conversations to understand the personal motivations, family needs and life goals – not just “how much?" and "by when?". 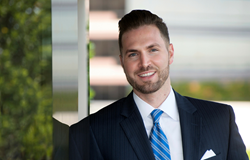 GV Financial Advisors is pleased to announce that Jordan Hutchison joined the firm as a Financial Advisor in March. Previously based in Huntsville, AL, Jordan spent three years as a Vice President/Junior Partner with Oak Tree Financial Services providing wealth management services. He's also worked for Lincoln Financial Advisors and USi, Inc.
GV’s progression to its Behavioral Wealth Model from traditional financial planning resonated with Jordan. Jordan holds FINRA® Series 7 and 66 licenses as well as Life/Health (GA & AL) licenses, and is pursuing his Certified Financial Planner (CFP®) status and IMCA’s Certification in Applied Behavioral Finance. He holds a Master of Science in Financial Planning and Counseling from the University of Alabama and a Bachelor of Science in Business and Psychology from the University of Montevallo. He can be reached at jordan.hutchison(at)gvfinancial(dot)com and (770) 295-5677.